Last Sunday (July 31), I led a trip to Lowder Mountain for NPSO. The original plan to take people to Balm Mountain had to be changed as a result of the amount of snow on the road (see Not Balmy Yet at Balm Mountain!). But a number of people hadn’t been to Lowder Mountain, and those that have usually enjoy it so much they are happy to return. 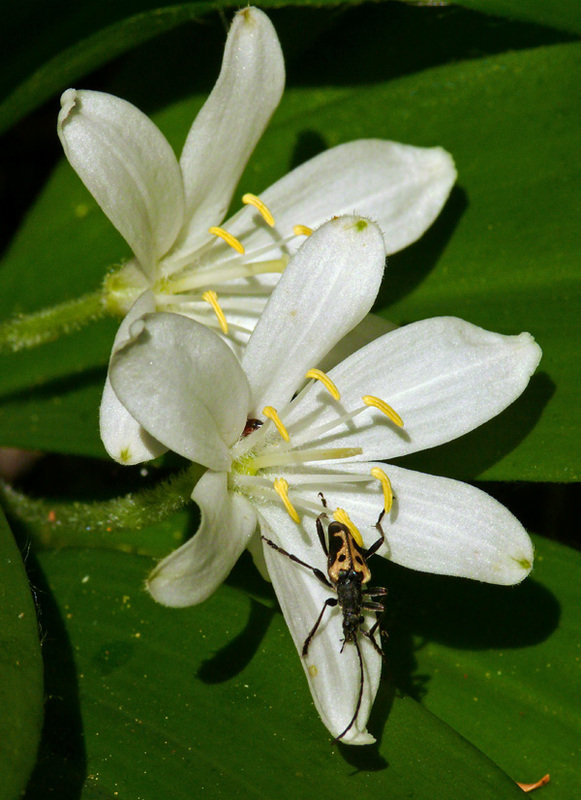 The woods were really pretty with an especially good show of both queen’s cup (Clintonia uniflora) and Columbia windflower (Anemone deltoidea). So many forest wildflowers are white or light-colored. These show up better in the shade for the pollinators—and wildflower lovers. At the first dry opening, there were many tiny annuals growing in still damp soil between the masses of Eriogonum compositum, including a yellow-flowered plant. I like to point these out because so many people miss these miniature gardens that fill in the spaces between larger perennials. After about 1.6 miles of traversing across sloping meadows and forest, the trail finally reaches a ridge below the summit where there is a wonderful natural rock garden. This is one of my favorite places as it has some north-facing cliff that is home to Gentiana calycosa, Castilleja rupicola, and Campanula rotundifolia. These can’t be seen without leaving the trail a short ways. 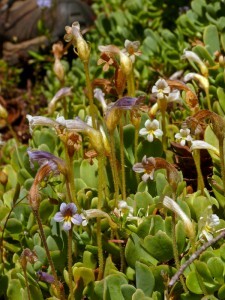 Unfortunately we were too late for the peak bloom, and too early for the late blooming gentians and Campanula, but on the way up to eat lunch on the rocks, someone discovered a sizeable population of naked broomrape (Orobanche uniflora). These parasitic plants are always fun to find. Along with the common light purple flowers, there were many pale-flowered naked broomrapes (Orobanche uniflora) parasitizing some creamy stonecrop (Sedum oregonense). We had to keep up a pretty good pace since we were hoping to have at least a little time at the wonderful Quaking Aspen Swamp, but we did spend a little time at the large meadow in the intersection. I believe this is the only site in Lane County so far for the little annual Gilia capillaris. Apparently it has been moved to the genus Navarretia (but keeping the now confusing common name of miniature gilia, according to USDA Plants Database), but I still think of those as being tiny spiky plants like the Navarretia divaracata that was growing with it. Many of these annuals in the phlox family have been shuffled back and forth among the different genera. Whatever their name, these little white flowers were growing en masse in the open ground. When Sabine and I first came across it here in 2008 (see New Plant for Lowder Mountain), it wasn’t nearly this obvious. Unfortunately, I was unable to spot any sign of the onion I was hoping to find after seeing dried skeletons in this same area last year (see Last Wave of Flowers at Lowder Mountain). Even all those different pairs of eyes didn’t help. Perhaps as late as the bloom is this year, it still isn’t up yet. 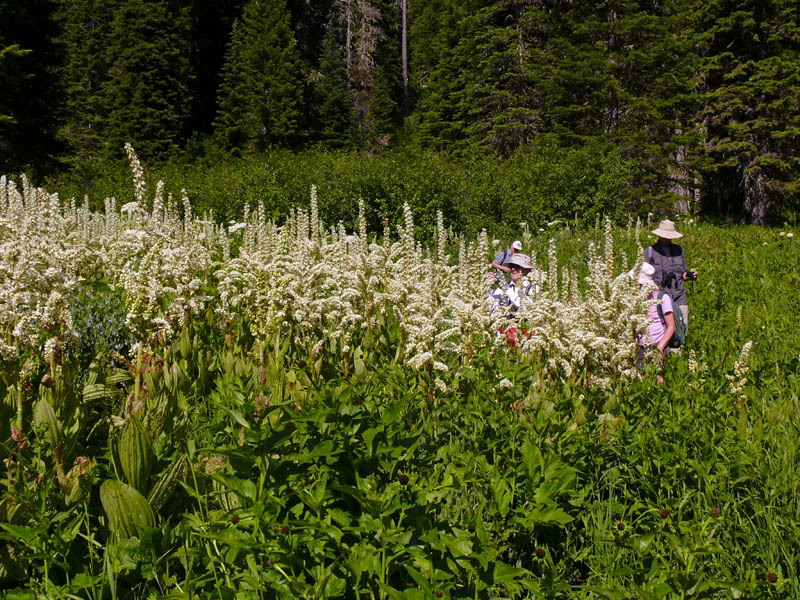 Field trip members wading in a sea of Veratrum californicum at Quaking Aspen Swamp. The corn lilies seem to be having a big bloom year in 2011. Up at the summit, things were only starting to come up after the late snow melt. There was some confusion about whether to go across the top to the view or head down to Quaking Aspen Swamp. In the end, most people went to see the viewpoint and encountered an irruption of toads. Several of us headed back and eventually five game folks joined me for an hour down in the wetland while everyone else went home. It was beautiful down there, and we were thrilled to find no mosquitos. 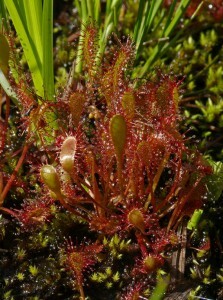 Jake Hurlburt was focused on seeing the wonderful sundews, so we headed that way. There were still some early bloomers including Viola macloskeyi, V. adunca, and Ranunculus gormanii hanging on along the south edge where the snow hangs on. Later bloomers like blue-eyed grass (Sisyrinchium idahoense) and alpine aster (now Oreostemma alpigenum) also bloomed here. 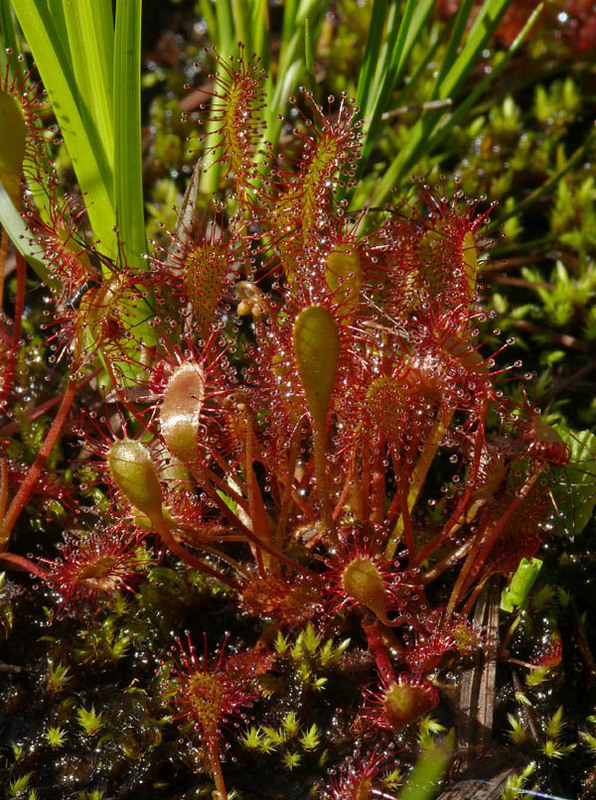 Farther in, we found the sundews, both Drosera rotundifolia and D. anglica (or perhaps the latter are hybrids as they aren’t as elongated or tall as some I’ve seen elsewhere. I’m told only looking to see if they make viable seed will indicate if they are true D. anglica.). We continued over to the creek that meanders through the meadow. It is a narrow deep channel in most places. We found a great deal of wildlife in the water including several crayfish, many salamanders with their gills quite evident, some rough-skinned newts, and what we decided must be leaches, their flat bodies undulating as they moved—this is right after I mentioned that it looked deep enough to swim in. I wish we’d had more time there, but at least everyone who stayed on got to see what a cool place this is to explore.